The year is coming to end. It is time to round up our top gaming experiences of 2011. 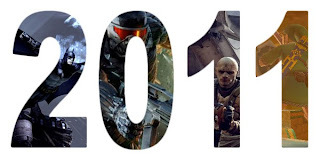 Before I collect my personal favorites for the EXP Podcast or for PopMatters, I want to discuss three games that will not make my list, but nevertheless delivered some the best gaming moments I experienced this year. I have shared my thoughts on both the terrible feature creep plaguing Revelations and the interesting narrative directions Ubisoft took Ezio. The single-player portion of the game differs only slightly from its predecessors and manages to mostly satisfy when not playing the irritating tower-defense components of the game. The multiplayer, however, deserts a heaping amount of praise. Assassin’s Creed: Brotherhood introduced the groundbreaking game of deadly hide-and-seek in which assassin’s simultaneously hide amongst crowds of character models, some of which match their own, and stalk their prey through these same crowds, looking for the hint of bizarre movement that separates player from computer AI. I implore you: Play either Brotherhood’s or Revelations’ multiplayer game and experience one of the most interesting and unique competitive games available. While Revelations keeps the formula relatively consistent, it does sharpen some of its features, such as refining player radar detection. It also features a traditional “deathmatch” mode, which removes the “hiding-amongst-AI-clones” element by giving players unique character models. I initially disregarded this mode as a hastily put-together addition. Now I realize it instead polishes the sensation of the hunt, requiring players use a sharp eye and quicker fingers to take down components who know exactly what the hunter looks like. Revelations might not make my short list, but its multiplayer remains as rock solid as ever and one of the year’s highlights. Rocksteady’s superhero star came out in 2009, but I failed to pick it up until just a couple months ago, so forgive me for stating the obvious: good god Arkham Asylum is good. Batman is already a fascinating icon, and Rocksteady pulls few punches in treating the character as the troubled, mortal, and intelligent person he is. They also put so much care in character animations that I felt very much in control, embodying Batman perfectly. I felt more like Batman playing Arkham Asylum than I ever did dressing up as the caped crusader for Halloween. I was also enamored by the island mental institution and its brilliantly situated pathways through its ever changing landscape. I am incredibly excited to watch Nolan’s Dark Knight Rises, but not as as excited as I was to get my hands on Arkham City, which just might reappear again on a year-end list. Considering I first played Minecraft in 2010, I am hesitant to list the game on my own Game of the Year list. However, its official release occurred this past month, and it would be remiss to ignore what is undoubtedly a groundbreaking and phenomenal experience because of its strange release history. My highlights in the world of Minecraft include frantic journeys through darkened forests looking for a trace of the signal fire above my base and wandering around an immense cave system, refusing to leave until I had lit every shadowed corner. I also spent several nights exploring multiplayer servers, most notably a scale model of J.R.R. Tolkien’s Middlearth built by committed fans and, without a hint of sarcasm, digital engineers. Today I rarely explore the cubed world of Minecraft, but when I do, I spend days imagining possibilities, mapping out a gorgeous base, investigating the work of others, then becoming disheartened by all the beautiful contraptions and fantasy islands I will never create. Minecraft is a world of the imaginary that takes a surprisingly large effort to shape to ones liking, but its allure is everlasting. For that alone it deserves my attention as one of the best games of the year.